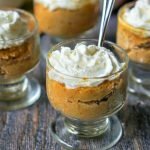 One bite and you will be hooked on this low carb mini pumpkin pie. Especially because it it only takes 5 minutes from start to finished and has 2.4g net carbs per serving! Using two small ramekins, divide the butter between both and microwave for 30 seconds. Meanwhile in a large bowl, mix together the egg yolk, coconut flour, sweetener, pumpkin pie spice, cream and pumpkin. When the butter is melted, swirl around ramekin to essentially grease the inside and pour the excess butter in the batter. If you wish you can just spray the ramekins with cooking spray and melt the butter separately. Just pour the melted butter in the batter and mixl well. Divide the mixture into the two ramekins and microwave for 30 seconds. Check to see if they are done. You want the middle to be a bit moist so it doesn't over cook. If it needs more cooking, just cook for 10 seconds more until done.